While you may think more coffee is better, what you fail to realize is that ristretto is all about quality and not quantity. When you mix less hot water with finely ground coffee beans, what you get is a concentrated flavor with a sweet taste. That’s because the shorter extraction time doesn’t make the coffee bitter. 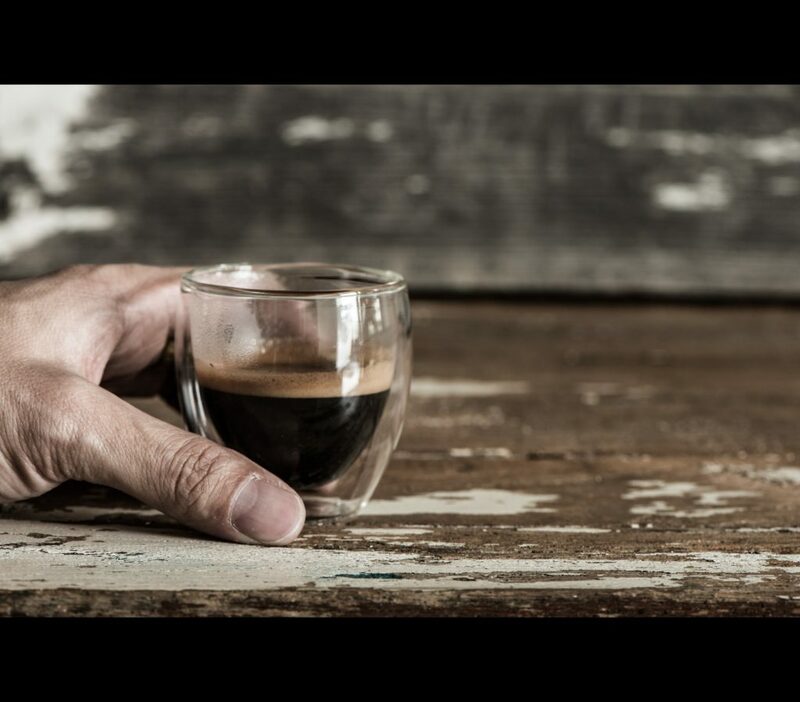 In simple words, ristretto translates to “restricted.” So the next time you are ordering a ristretto shot, you get a limited amount of espresso shot in your coffee. Most people have yet to try out their first ristretto. The truth is, once you enjoy this smaller version of espresso, you are less likely to go back to your old coffee mug. That’s because what you get is sheer quality along with an aromatic flavor of coffee beans. If you seek pure pleasure and satisfaction out of your coffee cup, you need to add ristretto to your daily life. People who don’t have much experience and expertise with coffee should first select the type that suits them the best. However, if you are a true coffee lover, you know what coffee actually tastes like, regardless of its type. While some of us like sweeter versions of coffee others are addicted to a more bitter taste. Then there are some who drink coffee with milk. How you like your coffee, is all up to you. Ristretto is strongly related to Italy. This short coffee comes with a strong taste and is nothing like your regular dose of coffee. Thanks to its unique extraction process, true coffee fans consider it the best type of coffee to have for rejuvenating all senses. The word ristretto means restricted in Italian. A barista prepares ristretto from the first portion of espresso. With a rich flavor and a higher concentration, the coffee is not bitter because of its extraction method. When we prepare espresso, we consume roughly fifteen grams of coffee to make somewhere around sixty grams with hot water. However, when we are making ristretto, thirty grams comes out of fifteen grams of coffee. 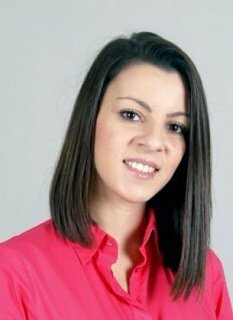 You can also say that we stop the extraction process and various compounds are extracted in various extraction phases. For that reason, ristretto does not taste like your regular espresso and more like sweet syrup. This type of coffee is always served with a glass of water. Commonly referred to as a short black, some of the most modern appliances consume even less than 60 ml of water or 45 ml of water to prepare a simple shot of ristretto. If you are wondering how to make ristretto coffee, there is more than one method. The first method is to grid the coffee finer just like for normal Espresso and prepare a shot. Smaller spaces between ground coffee enable less water to pass through, but can also lead to a gritty taste. The second method is to put a stop to the extraction early, allowing less water to pass through the coffee. This is the simplest method to produce a unique taste than what we would get out of fine grinding. Then there is another method to make ristretto which is to use the tamp more firmly to compact the grinds in the filter basket, allowing for a short time equivalent to a regular espresso. Short or long shots do not comprise the same ratio of components as a regular shot since all elements of coffee dissolve at a different speed when different amounts of water are used. This incredible chemistry leads to a ristretto being twice as strong as regular espresso. How to drink a Ristretto? To enjoy the true essence of ristretto, you’ll need to forget your frothy mil. That’s because ristretto is conventionally consumed as a black shot. But, you can also use a double or single ristretto, according to your preferences. The major difference between the two types of coffee is that more water is used in espresso than a ristretto. If you can’t imagine spending a day without coffee, you must taste ristretto once in your life to know what coffee actually tastes like. In fact, you can also experiment and get creative with different methods to create the best shot of ristretto. Naturally, a ristretto is stronger than an espresso since it is less diluted by water. You get unique flavors via a shorter extraction and not by longer espresso extraction. Espresso refers to the ‘shot’ we all get at the local coffee shop. Espresso beans are not too different than coffee beans. But the real difference lies in the preparation method. At a basic level, espresso is made when a small amount of water is forced through a finely-ground and tightly-packed bed of coffee at extremely high pressure. Depending on your espresso machine, the amount of coffee and the amount of water is slightly variable. However, the result is almost always the same. You get a tasty and concentrated dose of coffee that brings in the uniqueness of this brewing method. The best part is that the process also creates delicious crema on the shot’s surface. However, a variation on the espresso method is called ristretto. When preparing a ristretto shot, you restrict the water supply by half. This restriction implies that less water saturates the grounds and results in lower caffeine which some consider a downside. But ristretto actually focuses on the more aromatic aspects of the espresso method. Although less water passes through the bed of grounds, it flows through quicker, leaving some of the ‘higher’ notes of coffee still intact. But ristretto shots are less popular than espresso, owing to no caffeine kick and a smaller yield. For coffee enthusiasts who want to develop a deeper understanding of coffee’s performance at all levels, the best way to assess its many flavors is a ristretto. This type reveals some of the most delicate notes of coffee which most ‘wet’ and longer extraction methods would not deliver. 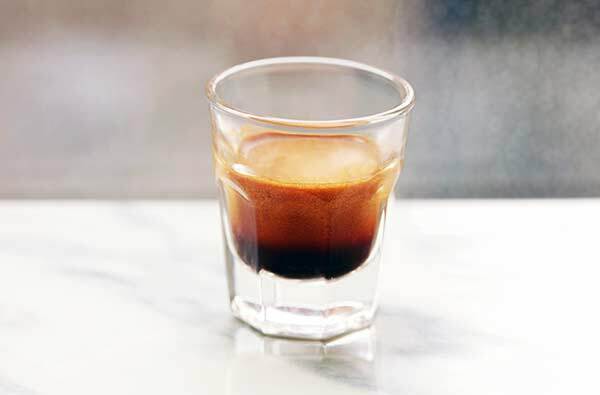 A typical recipe for an American ristretto shot is around 7 grams of coffee/12.5-15ml of water. You can get a yield of around 11 ml. Based on altering the amount of water used in the standard espresso recipe, Lungo is another unique method of preparing coffee with an espresso machine. In this case, you use double the normal amount of water/7 grams of coffee to extract more caffeine and deeper notes. 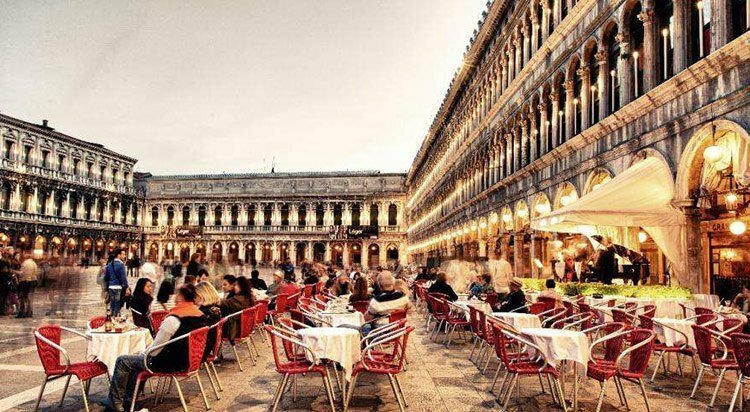 Like a ristretto, lungo is also less popular than Espresso because only a few people know that there is a possibility of preparing such type of coffee. If you are looking forward to maximizing your caffeine intake, lungo is the way to go. A standard lungo recipe requires grams of coffee/50ml of water to provide a yield of 45 ml. It is important to know that lungo, ristretto and espresso are all variations on the same method of preparing coffee. The difference lies in the caffeine concentration and flavor. Thanks to nuttier, darker and earthier notes, Espresso offers all the flavors that you can expect out of coffee. Some of the best espresso shots offer strong flavors of cocoa and chocolate. Sometimes, you would feel as if you are drinking melted chocolate. The tan-white foam and the crema that forms on the surface of your espresso shots is one of the sought-after parts of espresso. In fact, that’s considered a defining characteristic of this type of coffee. You get cream, chocolate and marzipan notes, which make Espresso extremely enjoyable. In fact, espresso also manages to capture floral notes that you get with the same coffee prepared differently. However, these notes taste different against the earthier background. High pressure and the extraction time make way for the strong earthy undertones of basic espresso. While ristretto shares the high pressure, the only difference in this process is the amount of water which means shorter extraction. As a result, we get a few of the earthy notes, but the crema gets thinner and the chocolate notes are usually absent. Instead, you get aromatic and floral coffee notes. When you are ordering your first ristretto, get ready to experience some strong herbal and floral notes. There are only a limited number of people that like the taste of lungo. Some people note that the only flavors that remain in this type of coffee are smoke and roasty notes. Since extraction is close to being overdone, it might actually taste like burnt espresso. However, some people prefer this taste and that’s why Lungo continues to remain a popular type of coffee. Since its rich in aromas you can also have it by mixing it with milk. If coffee is a crucial part of your life, then you need your daily dose of caffeine to get through the day. Nobody wants to succumb to an intense headache by midday. Like many people, you probably order ‘flat white’ every day. Dependable and easy to pronounce, this type of coffee is perfect to give your day a much-needed boost. But when you’re looking for something really solid, a ristretto shot is just what you need. Ristretto Bianco is a smaller-sized café latte prepared with ristretto and not espresso. We all know that a latte is a sweet coffee drink made from of one shot of espresso and around eight ounces of steamed milk. If you don’t want to get the foam on top, you have to order ‘flat white’, which is basically the same coffee. As coffee sizes are larger in the U.S., coffee shops commonly prepare lattes with a double shot of espresso. 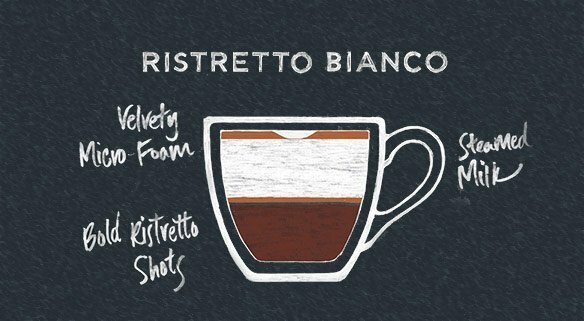 So ristretto Bianco is a café latte, made with a double or sometimes quadruple shot of ristretto, using steamed milk along with foam poured on top of it. Not only it is delicious, but the coffee also does a great job to give you a boost. Since Lattes are generally sweet drinks, a perfectly made ristretto shot is sure to enhance the true taste of lattes. In case ristretto is not pre-programmed, espresso certainly will be. 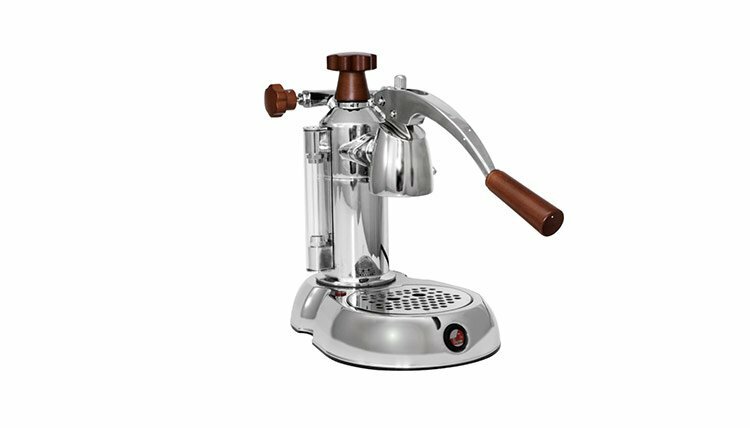 Begin with the same programming and modify the settings to get 15ml of output over 15 seconds, rather than the espresso’s 30/30 configuration. Set the grinder to pulverize your beans as you would typically use for espresso. As this is a double shot, you ideally want 30 ml of ristretto (for just one cup), or 15 ml of ristretto (for two cups), with an extraction period of 15 about seconds. The Ristretto shot is often regarded as ‘the perfect pour.’ While some coffee fanatics argue whether ristretto is actually worth all the hype, others are convinced that it offers the ultimate coffee experience. If you’re someone who likes to add a shot or two of espresso to your creative coffee delights, you must try out the espresso shot to taste the difference. The unique taste of ristretto is rooted in the fact that individual chemical components of coffee extract at various stages. Hence, a ristretto has its own exclusive flavor. While ristretto may not have the perfect balance of a well-prepared espresso, the coffee offers a sweet and fruity taste. For people who prefer having short and intense coffee, but never enjoy espresso, a ristretto is the perfect type of coffee to renew the day. 2 How to drink a Ristretto?